Last night(July 26th) in New York, Dua Lipa was spotted leaving the Late Show with Stephen Colbert following her performance of 'IDAF'. 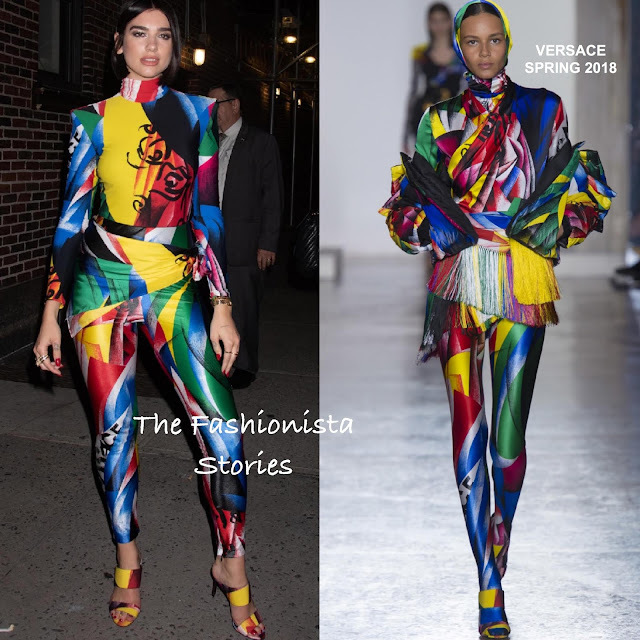 For her outing, she wore a VERSACE FALL 2018 colorful long sleeve jersey turtleneck top with the matching jersey leggings and mule sandals. If this looks familiar, that's because Gigi Hadid wore it in June 2018. Allowing nothing to take away from her bold, colorful look, she went with minimal makeup and a center part, straight bob with one-side behind-the-ear. A selection of gold rings finished up her look.